Because Langerhans cells (LC) in peripheral tissues are generally “immature” cells with poor lymphostimulatory activity, the contribution of immune responses initiated by LC to the pathogenesis of pulmonary LC histiocytosis (LCH) has been uncertain. In this study we demonstrate that LC accumulating in LCH granulomas are phenotypically similar to mature lymphostimulatory dendritic cells present in lymphoid organs. LC in LCH granulomas intensely expressed B7-1 and B7-2 molecules, whereas normal pulmonary LC and LC accumulating in other pathologic lung disorders did not express these costimulatory molecules. The presence of B7+ LC in LCH granulomas was associated with the expression in these lesions, but not at other sites in the lung, of a unique profile of cytokines (presence of GM-CSF, TNF-α, and IL-1β and the absence of IL-10) that is known to promote the in vitro differentiation of LC into cells expressing a lymphostimulatory phenotype. Finally, LCH granulomas were the only site where CD154-positive T cells could be identified in close contact with LC intensely expressing CD40 Ags. Taken together, these results strongly support the idea that an abnormal immune response initiated by LC may participate in the pathogenesis of pulmonary LCH, and suggest that therapeutic strategies aimed at modifying the lymphostimulatory phenotype of LC may be useful in the treatment of this disorder. Pulmonary Langerhans cell (LC)3 histiocytosis (LCH), also referred to as histiocytosis X, is a rare disorder of unknown origin characterized by the presence in the lung of destructive granulomas containing large numbers of LC (1, 2). Strikingly, the granulomatous lesions in LCH are centered on bronchioles, the only site in the normal human lung where LC, members of the dendritic cell (DC) lineage, are found (1, 2, 3, 4). The pathogenesis of LCH is not understood. Several arguments, however, support the hypothesis that this disorder is the result of an abnormal immune reaction initiated by LC (2). First, the major function of LC in the lung and other tissues is to sample Ags in the local milieu, process the proteins, and present the resulting antigenic peptides in association with MHC molecules to T cells, thereby initiating immune responses (5). Second, LC and T lymphocytes are the predominant cell types present in early lesions of pulmonary LCH (2), and close contacts between the two cell types, identical to those observed in the course of hypersensitivity reactions in the skin are frequently observed in pulmonary LCH granulomas (6, 7). Third, as expected for T cells responding to extrinsic Ags presented by LC, T lymphocytes infiltrating early pulmonary LCH lesions are predominantly CD4+ T cells expressing α/β TCRs (7), and evidence for local activation of these lymphocytes has been provided (8). However, considerable evidence indicates that normal LC in peripheral tissues, including lung LC, have limited ability to activate T cells in situ (5, 9, 10). Rather, tissue LC are thought to act as sentinels that avidly internalize and process Ags, but only subsequent to migration to regional lymph nodes and further differentiation do they acquire the capacity to stimulate T cells (5). This temporal and spatial separation in the functional capacities of LC in peripheral tissues and lymphoid organs has been suggested to be an important mechanism through which inappropriate pulmonary immune responses against innocuous inhaled Ags are avoided. Thus, the development of an immune response initiated by LC in pulmonary LCH would imply the presence of factors that not only increase their number at the sites of the disease, but also enhance their ability to activate T cells locally. In this regard, the interaction of B7 molecules (B7-1, B7-2) expressed by DC/LC with the CD28 receptor expressed on T cells is of critical importance for the optimal T cell activation (reviewed in Ref. 11). The expression of B7 molecules by pulmonary LC from man has not been evaluated, but as would be expected for cells with weak lymphostimulatory activity, LC present in the normal human skin and lung DC freshly isolated from rodents have been shown to be B7 negative (10, 12, 13). In contrast, when cultured in vitro, these cells up-regulate the expression of B7 molecules at their surface and acquire strong lymphostimulatory activity (12, 13, 14). Several cytokines have been identified that modulate the surface expression of B7 molecules by DC/LC in vitro and may participate in the acquisition of lymphostimulatory activity by DC/LC in lymphoid tissues (11, 13, 15, 16, 17). In addition, cytokines can also regulate the expression of CD40 on cells of DC/LC lineage, and ligation of CD40 by its ligand CD154 expressed by T cells can also induce B7 expression, thereby improving the lymphostimulatory capacity of these cells (18, 19, 20). If the LC present in large numbers in LCH lesions are responsible for initiating the abnormal granulomatous immune response in situ, these cells, but not normal LC, would be expected to have an immunophenotype compatible with the expression of strong lymphostimulatory activity. In this study we demonstrate that this is the case. LC in LCH granulomas intensely express both B7-1 and B7-2, whereas normal pulmonary LC and lung LC accumulating in other pathologic situations are B7 negative. Further evaluation permitted the identification of several factors unique to LCH granulomas that may promote the development of such lymphostimulatory LC. Pulmonary LCH. Lung tissue was obtained from five patients with pulmonary LCH (three men and two women; 34 ± 11 yr; all current smokers) at the time of open thoracotomy. Characteristic granulomas containing numerous CD1a+ LC were present in all samples. LC were identified unequivocally at the electron microscopic level by the presence of numerous Birbeck granules. Normal lung tissue, peritumoral lung tissue, and lung cancers. Lung tissue was obtained from 10 patients at the time of thoracotomy for localized lung pathology. Five patients (four men and one woman, 60 ± 13 yr; all nonsmokers) had benign pathology. Five patients had primary lung carcinoma (four men and one woman; 60 ± 14 yr; all smokers). The histologic types of cancer were as follows: adenocarcinoma (n = 3) and squamous cell carcinoma (n = 2). Tumor tissue, tissue immediately adjacent to the carcinoma, and grossly normal lung tissue (taken at a site distant from the lesion or from a different lobe) were evaluated separately. Lung tissue from nonsmoking patients was normal. Lung tissue from smokers and peritumoral tissue demonstrated mild diffuse or focal fibrotic changes in alveolar walls, accumulation of pigment-laden macrophages, and alveolar epithelial hyperplasia. All tumors and peritumoral tissues included in this study were heavily infiltrated by CD1a+ LC as previously described (4). C57BL/6 transgenic female mice in which the gene encoding IL-10 was disrupted (IL-10 knock-out (KO) mice), and C57BL/6 wild-type female mice were obtained from The Jackson Laboratory (Bar Harbor, MA). After mice were sacrificed by sodium pentobarbital injection, lungs, spleen, tongue, and ears were removed. The pancreas of NOD mice, generously provided by Dr. C. Boitard (Institut National de la Santé et de la Recherche Médicale U342, Paris, France), which has previously shown to be infiltrated by DC-expressing B7 molecules, was also evaluated as a positive control (21). mAbs used with human tissues were as follows: anti-CD1a (BL6, Immunotech, Marseille, France); anti-CD80 (anti-B7-1, MAB104, Immunotech); anti-CD86 (anti-B7-2, B70, PharMingen, San Diego, CA); anti-CD40 (MAB89, Immunotech); anti-CD154 (Genzyme, Cambridge, MA); anti-CD3 (Leu-4, Becton Dickinson, San Jose, CA); anti-CD4 (Leu-3a+b Multiclone, Becton Dickinson); anti-CD8 (Leu-2, Becton Dickinson); anti-CD28 (CD28.2, Becton Dickinson); anti-human IL-1β, (Genzyme); anti-human GM-CSF (Genzyme); anti-human TNF-α (Serotec, Oxford, U.K.); and anti-human IL-10 (JES3–12G8, PharMingen). Isotype-matched Abs (MOPC 21, anti-IgG1; MOPC 141, anti-IgG2, Sigma, Saint Louis, MO) were used as controls. Rat mAbs used for murine tissues were as follows: anti-CD80 (anti-B7-1, 1G10, PharMingen); anti-CD86 (anti-B7-2, GL1, Serotec); and anti-MHC class II (NIMR4, Southern Biotechnology Associates, Birmingham, AL). An isotype-matched Ab (R35-95, PharMingen) was used as a control. For immunohistochemical staining, tissue fragments were immediately frozen in liquid N2 and stored at −80°C until use. Cryostats sections, 4- to 6-mm thick, were fixed in acetone and reacted with appropriate dilutions of Ab. For human tissues, positive cells were revealed using a Vectastain ABC-alkaline phosphatase kit system (Vector Laboratories, Burlingame, CA) and the fast red substrate. For mouse tissues, samples were reacted sequentially with secondary biotinylated rabbit anti-rat IgG Abs that had previously been adsorbed against mouse Igs (Vector Laboratories), avidin-alkaline phosphatase complexes (Vector Laboratories), and the fast red substrate. To test the specificity of immunostaining, Abs were omitted or replaced by an isotype-matched control Ab. Under theses conditions no positive cells were identified. The intensity of immunostaining was graded from 0 (absent) to ++ (strongly positive); complete agreement was obtained between two independent observers. LC strongly expressing CD1a Ags were observed within the bronchiolar epithelium in all samples of normal lung obtained from nonsmokers, and exhibited characteristic long cytoplasmic processes that intercalated between epithelial cells (Fig. 1⇓A). On serial sections, no expression of B7-1 or B7-2 by these cells could be detected (Fig. 1⇓B). As previously described (4), no LC were present in normal alveolar parenchyma, but areas of alveolar epithelial hyperplasia in lung tissue from smokers were infiltrated by CD1a+ LC (data not shown). Although LC accumulated in large numbers at these sites, no cells expressing B7 molecules could be identified. Similarly, the lung carcinomas included in the study were heavily infiltrated by CD1a+ cells with characteristic dendritic shape and long cytoplasmic processes intercalated between malignant cells (Fig. 1⇓C). In all cases, immunostaining of serial sections for both B7-1 and B7-2 failed to demonstrate any positive cells (Fig. 1⇓D). Expression of B7 molecules by pulmonary LC. A, CD1a+ LC in normal bronchiolar epithelium. B, Serial section from the same specimen showing the absence of LC expressing B7-1 molecules. C, Numerous CD1a+ LC infiltrating a lung adenocarcinoma. D, The same tumor nodule was completely negative with anti-B7-2 immunostaining. E, Strongly CD1a+ LC in a pulmonary LCH granulomatous lesion. 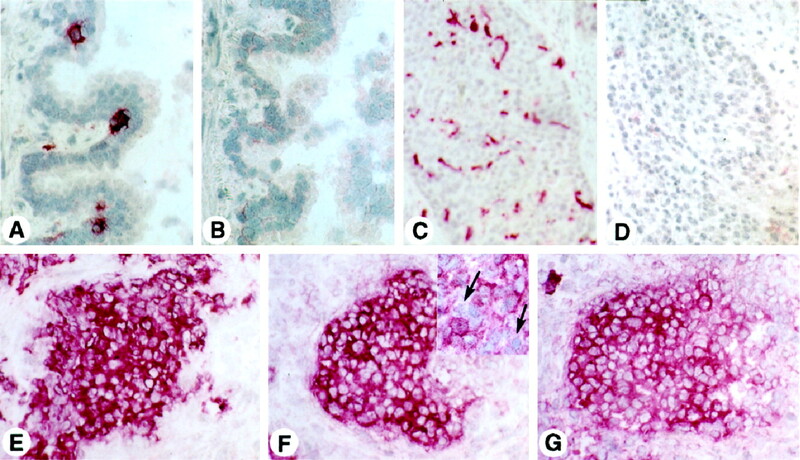 Serial sections of the same granuloma showing that these cells were intensely stained with anti-B7-1 Abs (F). B7-1 negative lymphocytes (arrows) are present between the LC (inset). LC in LCH granulomas were also intensely stained with anti-B7-2 mAbs (G). Original magnifications: A, B, and E–G, ×250; C and D, ×125; inset, ×500. As expected, LCH granulomas contained large numbers of strongly CD1a+ LC (Fig. 1⇑E). Strikingly, essentially 100% of these cells were strongly positive for B7-1 and B7-2 molecules (Fig. 1⇑, F and G). The alveolar walls and alveolar lumina adjacent to the lesions were frequently invaded by cellular infiltrates extending from the granulomatous mass that contained large numbers of CD1a+ LC. In both locations, LC also strongly expressed both B7-1 and B7-2 molecules (data not shown). However, not all pulmonary LC from these patients expressed B7 molecules. Both normal bronchioles and areas of alveolar hyperplasia not involved by the granulomatous reaction were present in the biopsies and contained intraepithelial CD1a+ LC. In neither case were these cells found to express B7-1 or B7-2 (data not shown). 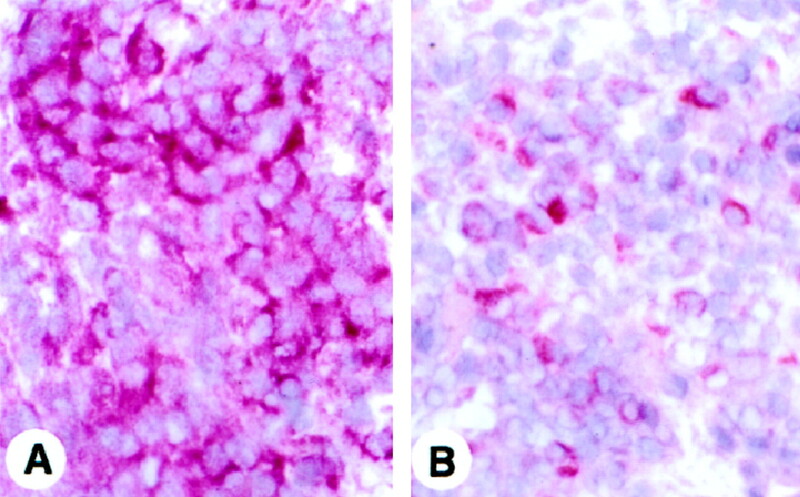 As indicated above, LC in LCH granulomas strongly expressed B7-1 and B7-2, but in the same biopsies, LC in uninvolved bronchioles and those in areas of alveolar hyperplasia distant from the granulomatous process did not express B7 molecules. Thus, the expression of B7 was not an intrinsic property of LC from these patients and suggests that differences in the local milieu of the granulomatous lesions resulted in the induction of expression of these costimulatory molecules. Therefore, we evaluated the presence of cytokines known to modulate B7 expression in LC granulomas and at sites where LC not expressing B7 molecules were found. As we have previously shown (4), GM-CSF was found to be expressed at all sites where LC were present in the lung, regardless of whether the LC expressed B7 molecules (data not shown). Similarly, TNF-α was abundantly expressed by normal bronchiolar epithelial cells, hyperplastic alveolar epithelium, and, as previously described (22), by all of the lung carcinomas. Within the LCH granulomas, the LC themselves were the predominant cell type expressing both GM-CSF and TNF-α, although the small number of macrophages infiltrating the lesions, like alveolar macrophages in the normal lung, also strongly expressed these two cytokines. Thus, although these cytokines may be important in recruiting LC to lung epithelia and maintaining cell viability, their presence was not sufficient to induce the expression of B7 molecules on pulmonary LC in vivo. In contrast, the presence of IL-10, the principal cytokine capable of down-regulating the expression of B7 molecules by DC/LC in vitro (13, 15, 16, 17) strongly correlated with the absence of expression of these costimulatory molecules on LC in the specimens studied. IL-10 was strongly expressed by normal bronchiolar epithelium, hyperplastic alveolar epithelium and lung carcinomas (Fig. 2⇓, A–C), sites where LC were found to be B7 negative. Conversely, IL-10 was not detected in LCH granulomas (Fig. 2⇓D). Correlation between the expression of B7 molecules by pulmonary LC and the cytokines produced in the microenvironment of these cells. Bronchiolar epithelial cells (A), hyperplastic alveolar epithelial cells (B), and lung carcinomas (C), sites devoid of positive LC, produced IL-10, whereas pulmonary LC granulomas (D), which contained strongly B7 positive LC, were constantly negative for this cytokine. All sites positive for IL-10 were negative for IL-1β (E, F, and G), whereas LC granulomas were intensely positive for this cytokine (H). Original magnifications, ×250. The expression of IL-1β was the mirror image of that observed for IL-10, i.e., this cytokine could not be detected in normal bronchiolar epithelium, hyperplastic alveolar epithelium or lung carcinomas (Figs. 2⇑, E–G) but was strongly expressed by LC granulomas (Fig. 2⇑H). The failure to detect IL-1β in lung cancers or normal and hyperplastic epithelia was not a technical artifact because alveolar macrophages and lung endothelial cells, cell populations whose distribution is different from that of LC, were positive for this cytokine in all biopsies (data not shown). To evaluate whether the absence of IL-10 was sufficient to permit the expression of B7 molecules by LC in peripheral tissues, we compared the expression of B7-1 and B7-2 by intraepithelial LC in normal and transgenic IL-10 K/O mice. DC expressing class II molecules were easily identified both in the epidermis and in the airway epithelium of both wild-type and IL-10 K/O mice (Fig. 3⇓A), but evaluation of serial sections demonstrated that these cells were B7-1 and B7-2 negative (Fig. 3⇓, B and C). These results could not be attributed to an inability to identify B7 molecules because the spleen of wild-type and IL-10 K/O mice and the pancreas of NOD mice were all infiltrated by numerous DC that were strongly positive for B7-1 and B7-2 molecules (data not shown). Thus, these results demonstrate that the absence of IL-10, although perhaps necessary, is not sufficient to permit the expression of B7 costimulatory molecules by LC in peripheral tissues. Bronchiolar epithelium from an IL-10 K/O mouse. 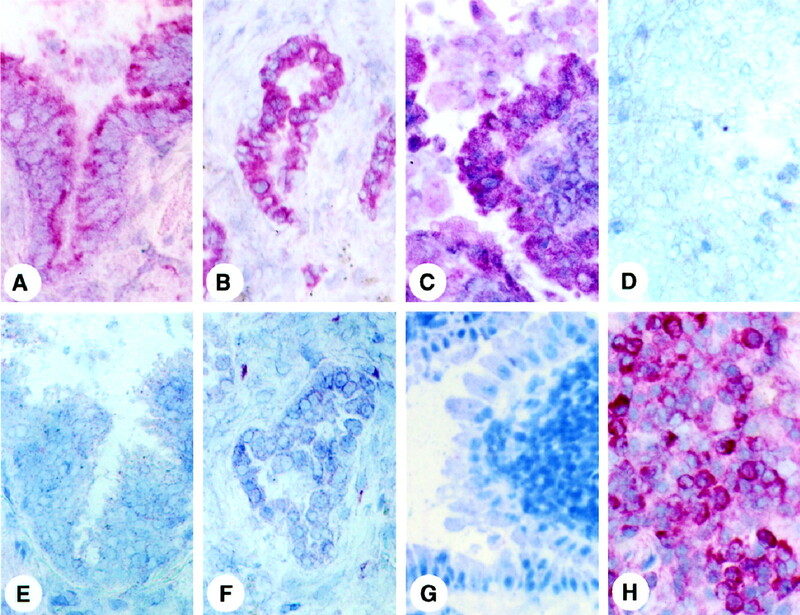 DC expressing class II molecules were identified in the airway epithelium (A), but serial sections of the same tissue specimen were constantly negative for B7-1 (B) and B7-2 (C) immunostaining. Original magnifications, ×250. Taken together, these results demonstrate that the profile of cytokines expressed in LCH granulomas (presence of GM-CSF, TNF-α, and IL-1β; absence of IL-10) would be conducive to the expression of B7 molecules by LC. The presence of IL-10 and the absence of IL-1β would favor the maintenance of LC in an “immature” state at other sites where LC are found in the lung. In this regard, it is noteworthy that although GM-CSF and TNF-α have been shown to up-regulate the expression of B7 molecules on LC (15), IL-1β, but not TNF-α, had a synergistic effect when combined with GM-CSF (23). Because the interaction between CD154-positive T cells and DC/LC expressing CD40 Ags has been shown to up-regulate the expression of B7 molecules by DC/LC (18, 19, 20), we also evaluated the expression of these molecules. All LC present in LCH lesions intensely expressed CD40; both the intensity of staining and the distribution of positive cells was very similar to that observed for B7-1 and B7-2 (Fig. 4⇓A). T cells present within the granulomas did not express CD40 (data not shown). The expression of CD40 by LC in normal bronchiolar epithelium and those infiltrating sites of alveolar epithelial hyperplasia could not be evaluated, because lung epithelial cells strongly express this Ag. Interestingly, however, CD40 could not be detected on the numerous LC infiltrating lung carcinomas. A, LC in pulmonary LCH granulomas intensely express CD40 Ags. B, On a serial section of the same granuloma, many T cells infiltrating the granulomatous lesion were stained with the anti-CD154 mAb. Original magnifications, ×250. T lymphocytes were present in considerable numbers in LCH granulomas, both interspersed between LC and surrounding the lesions. Most of these T lymphocytes were CD4+ T cells, although CD8+ T lymphocytes were also present, preferentially at the periphery of the granulomas. In all patients, the majority of these T cells were CD28+. Strikingly, ∼30% of lymphocytes associated with the LCH granulomas expressed CD154 (Fig. 4⇑B). It is noteworthy that T cells present in the airways and parenchyma of normal human lung were uniformly negative for CD154, and that T cells present in the areas of the biopsies from patients with LCH that were not involved by the granulomatous process were also negative for CD154. Similarly, although numerous CD3+/CD28+ T lymphocytes infiltrated lung carcinomas, sometimes in impressive numbers, no cell expressing CD154 were observed. Our results demonstrate that intraepithelial LC in the normal human bronchi and LC infiltrating sites of alveolar hyperplasia and lung carcinomas do not express B7 costimulatory molecules in situ, findings similar to those observed for human epidermal LC and intraepithelial DC in rodent lungs (10, 12, 13). These findings are compatible with the idea that pulmonary LC are immature cells that can capture and process exogenous Ags, but are unable to generate an immune response locally. In striking contrast, LC in LCH granulomas strongly express B7-1, B7-2, and CD40 and thus have a phenotype typical of “mature” DC/LC found in lymphoid organs, cells that express strong lymphostimulatory activity (5). As discussed earlier, a variety of arguments support the idea that LCH results from an uncontrolled immune response initiated by LC (2). Our findings add additional support to this hypothesis because they explain how these LC, despite their location in a tissue in which immature LC are normally present, would be able to provide the costimulatory signals necessary for T cell activation. Our results also give insights into why LC in LCH granulomas may develop their unusual lymphostimulatory phenotype. We found that the cytokine milieu at the site of LCH granulomas has unique characteristics, in particular the presence IL-1β and the absence of IL-10, that are propitious for the maturation of LC into a population expressing B7 molecules and high levels of CD40. The presence in these lesions of large numbers of T cells expressing CD154, a ligand expressed only transiently after activation, supports the idea that the LC are indeed activating T cells in situ. These studies, evaluating established LCH granulomas, do not provide insights into the mechanisms responsible for the initiation of the process. In this regard, it has recently been shown that LC in lesions from patients with both diffuse LCH and localized forms of the disease are of clonal origin (24, 25). However, several lines of evidence strongly refute the idea that adult pulmonary LCH is a malignant disorder, including the high proportion of spontaneous remissions seen in pulmonary LCH, the very low proliferation rate of LC in pulmonary LCH granulomas, and the virtual absence of LC in late lesions (2, 26). Nevertheless, such clonal LC could have abnormalities that predispose to the initiation of the process, such as increased sensitivity to maturation induced by cytokines or defects that interfere with the mobilization of LC toward regional lymphoid tissues. Pulmonary LCH is also strongly associated with cigarette smoking, and smoking-induced immune/inflammatory responses in peripheral airways may be required to initiate the abnormal differentiation of LC (27). Following these initial events, several pathways that would favor the persistence of granulomas containing lymphostimulatory LC in LCH were identified in these studies. First, LC granulomas destroy the bronchiolar epithelium, thereby eliminating the only local source of IL-10. Second, LC in LCH granulomas themselves were shown to produce GM-CSF, TNF-α, and IL-1β, cytokines that could promote the maturation of newly arriving LC. Finally, the strong expression of CD40 by LC in LCH granulomas and the presence of T cells expressing CD154 would promote CD40/CD154 interactions that increase the expression of B7-1 and B7-2 on LC, induce cytokine production, and improve the lymphostimulatory activity of LC. In summary, this study further supports the idea that an immune response initiated by LC is involved in the pathogenesis of adult pulmonary LCH and provides evidence that the unusual state of activation of LC within the lesions is influenced by cytokines produced in the local milieu. These findings suggest that therapeutic strategies based on the modulation of cytokine production may be useful in this often disabling disorder for which no efficacious treatment is currently available. Likewise, therapies designed to induce the expression of costimulatory molecules by LC may be helpful in inducing immune responses against lung carcinomas. ↵1 This work was supported in part by a grant from la Fondation Martine Midy. ↵3 Abbreviations used in this paper: LC, Langerhans cell; LCH, LC histiocytosis; DC, dendritic cell; KO, knock-out. Tazi, A., A. J. Hance, P. Soler. 1997. Cells of the dendritic cell lineage in human lung carcinomas and pulmonary histiocytosis X. M. F. Lipscomb, and S. W. Russell, eds. Lung Macrophages and Dendritic Cells in Health and Disease 725 Marcel Dekker, New York, NY.